Without doubt it seems to you, that yours is a peculiar case. You think there is none like you in the world. Indeed there are. It may be, ten thousand persons are now in the same state of mind as you. I myself was so a few years ago. I felt the wrath of God abiding on me. I was afraid every hour of dropping into hell. I knew myself to be the chief of sinners. Though I had been very innocent, in the account of others, I saw my heart to be all sin and corruption. I was without the knowledge and the love of God, and therefore an abomination in his sight. But I had an Advocate with the Father, Jesus Christ the Righteous. And so have you. He died for your sins; and he is now pleading for you at the right hand of God. O look unto Him, and be saved! He loves you freely, without any merit of yours. He has atoned for all your sins. See all your sins on Jesus laid! His blood has paid for all. Fear nothing; only believe. His mercy embraces you: It holds you in on every side. Surely you shall not depart hence, till your eyes have seen his salvation. That’s it for this week’s installment. Now jump into the comment thread below. Have you heard the teaching that God loves some differently from others (or does not love some at all, and actually hates them)? What do you make of this? Taken from Wesley, J. (1872). The Works of John Wesley (Third Edition., Vol. 12, p. 493). London: Wesleyan Methodist Book Room. 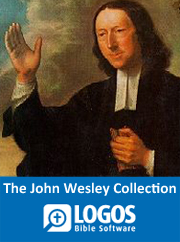 Learn more about John Wesley here.Buy your copy of the Wesley Collection in LOGOS here. Just to clarify, I am blessed to say that I have never been taught that God loves some more than others. I have only been taught that he loves. But somewhere deep down in myself, there is that belief, still that I am a screw up. I don’t even know if I knew it was there. The circumstances of life sucked it out and brought it to the surface like the venom of a snake. It stings. But all I can do is push back against it by moving toward the things I know to be true. I learned that in this really cool class that I took before I was baptized. It’s okay to not be perfect. Thanks for that. Welcome to ThinkTheology.org, home of diversity. Ha ha! So where can I find encouragement from Wesley here? I don’t know… I like Wesley. He’s a good guy. I’m not convinced his thoughts are always as rooted in the best exegesis, but I still like him… not as much as Whitefield and the other Scottish and Irish Methodists, but I like him. I often wonder about the issues of God’s love and God’s hatred from an Arminian perspective because I guess I haven’t heard a lot of reflection on certain verses in the Bible. For example, how does an Arminian account for God’s love (or hatred) in relation to John 3:36: “Whoever believes in the Son has eternal life; whoever does not obey the Son shall not see life, but the wrath of God remains on him.” Since Arminians and Calvinists both don’t deny Total Depravity, how do Arminians account for the state of being under God’s wrath? Does God love those whom he has placed under his wrath? Or does he have a hatred for them at all, or just their sin? I have heard it stated like this: “what the heart loves, the will chooses, and the mind justifies” (via Thomas Cranmer). Our theology, or beliefs, have a great influence upon our actions. Hence, knowing God’s love for us is so transformative. That’s probably why the Apostle Paul prayed that the Ephesians would have a better understanding of God’s love (Eph. 3:14-19)! Luke, these are legitimate concerns, and there should be no attempt by anyone to remove anger and even hatred from our lexicons of God’s attributes. However, I think hatred and wrath are two different things. Jn. 3:36 (and others like Rom. 1:18, 2:5, 8 Eph. 2:3, etc) speak of God’s wrath (ὀργή). For me (an Arminian) there is no disjunction between the idea that God could love me and be angry with me at the exact same time (thank you parenthood, for teaching me that lesson!). But there is dissonance, I think, between the idea that God loves me and hates me at the same time. So, I don’t necessarily think I’d use verses about God’s wrath to communicate God’s hatred of people. So, Wright wants to teach (and I agree) that God does not hate people, but he hates what has happened to people that he loves. And people that he loves, who refuse his love and gracious offer of salvation abide in his wrath (anger), but not his hatred of them as persons. Jesus’ command to “Love your enemies” is not just an ethical command. It is primarily theological. Jesus incarnates God. Jesus is telling me to be like my creator; to reflect him in my relationships just as God does. If “love your enemies” is, at its core, theological – then God loves his enemies, though he may be angry with them (every day) at the exact same time (cf. Ps. 7;11). But again, his anger has to do with what has happened to them. They have been marred and twisted away from God’s original created intent for them. It would make me incredibly angry if someone corrupted my son and twisted him. I would be angry at what happened to him, but I could not hate him. I would love him, hate what happened to him, and be angry about that all at the same time. My love would compel me to do everything I could to restore him. His refusal to accept my love would keep him in the state that kindles my anger, but again, I would not hate him. Never.That may be a starting place for more discussion. Not sure my feedback even talks to your question.